From preserving food quality to more autonomous satellites, the Space Exploration Masters competition awarded more than €800 000 worth of prizes to cost-effective and innovative solutions that promise to unlock the space business. This international competition, initiated by ESA and AZO, is Europe’s launch pad to boost business and innovation beyond Earth’s orbit. Visionary entrepreneurs brought new ideas and creative thinking to a new space economy. “It is now easier than ever to be an active participant of space exploration. Giant space agencies and institutions are no longer the only players. 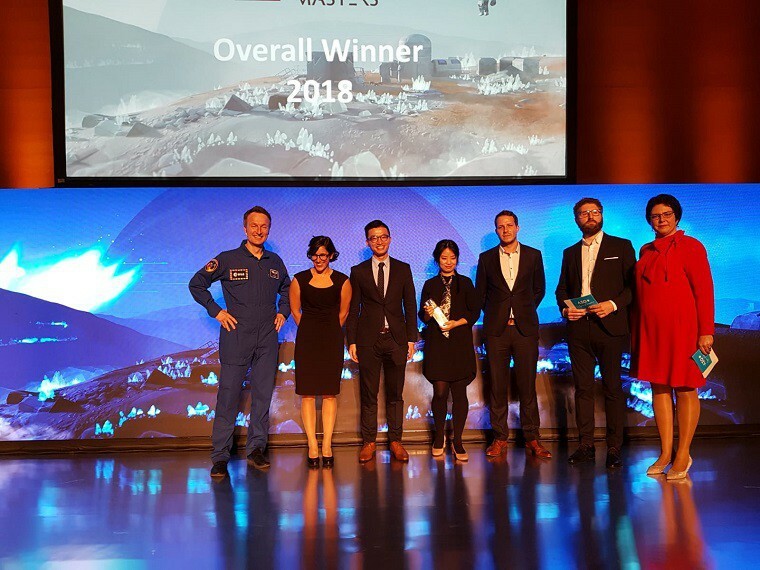 Many new actors from around the world are joining the endeavour,” said ESA astronaut Matthias Maurer during the awards ceremony held on 30 October at the Space for Inspiration conference. The 5 finalists had 60 seconds to defend their ideas in a pitch battle during the ceremony. The audience – both at the venue and online – voted in real-time for what they considered to be the most inspiring initiative for space exploration. The overall winner was Alginity, a new kind of bioreactor to produce food and oxygen for astronauts. “Algae made life bloom on Earth, and it is only natural that we take our friend with us on our quest for space exploration,” said the team leader María Teresa Pérez Zaballos. “Nature has already done the hard engineering work for us by creating these wonderful life forms that could sustain mankind on the Moon and beyond,” she added. Her team will receive expert advice for the development of the business idea. More than 130 start-ups, entrepreneurs and research teams from 42 countries answered the call of this initiative for both space exploration missions and applications back on Earth. One cost-effective solution that integrates all the electrical interfaces of a space system into a single, 3D-printed module and a affordable deployable antenna for space communications in space will fly in a cube-sat to the International Space Station. Flight opportunities are provided by commercial sponsors such as ICE Cubes and Bartolomeo, to business incubation services and coaching support, the prizes are supported by world-class institutional and industrial partners. Learn more about the finalists and the 14 partners behind the competition in this brochure. The five challenges addressed business innovation around health and food, on-orbit missions, commercial access to space and sustainable exploration. Regine Heue, Head of Marketing & Communications at AZO, is responsible for planning, development and implementation of all of marketing strategies, marketing communications, and public relations activities, both external and internal. She oversees development and implementation of marketing materials and services, communications and public relations. She directs the efforts of the marketing and creative team.